AffiniPay has created sample backend and mobile apps that you can download and install to familiarize yourself with how the mobile SDK works. The sample backend app simulates a backend server integrated with the AffiniPay Payment Platform. You can use this sample backend app with the sample mobile app to see how transactions work or with your own mobile app for testing purposes, after you’ve integrated the mobile SDK. Install the Bundler gem and its dependencies. Download the sample backend app from github: https://github.com/affinipay/app-integration-example-ruby. Log in to the AffiniPay web application: https://secure.affinipay.com/login. 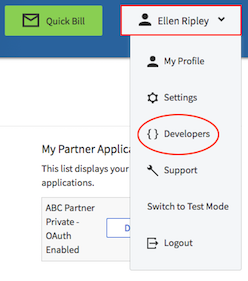 The My Partner Applications section on the right lists your partner OAuth applications. Locate the partner OAuth application whose client ID and secret you want to retrieve and click Edit. 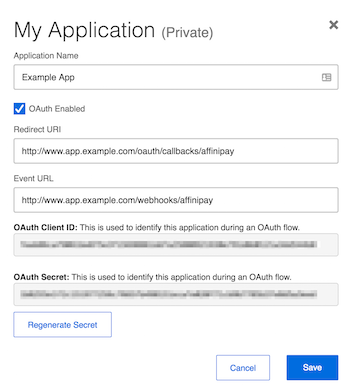 Copy the OAuth Client ID and OAuth Secret into the env.rb file that you downloaded with the rest of the sample backend app files.